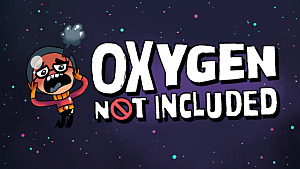 Since oxygen is the number one resource in Oxygen Not Included, it would be wise to learn all the possible ways to get this precious gas. 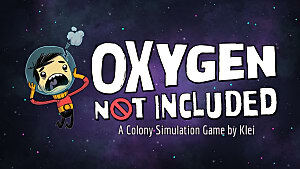 The most common way is to generate oxygen from algae, but usually, it’s really hard to find enough of this resource to sustain an entire colony of Duplicants. 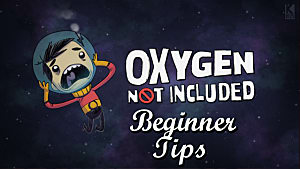 So, this guide will help you find a couple of alternative and more reliable solutions to generate oxygen, using such machines like the Electrolyzer and Air Deodorizer. First, you must complete the research for the Advanced Filtration and Percolation branches. 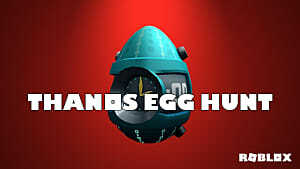 This will unlock the Electrolyzer in your menu, and all it requires is 200kg of Raw Metal. 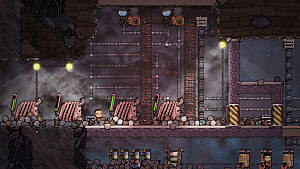 Set the Electrolyzer on the bottom floor of your base, and put Gas Pumps and a Hydrogen Generator on the top floor. The rooms between the bottom and the top floors should be made of Gas Permeable Tile, which is available from the Gas Piping menu. This kind of tile will not prevent the gas from traveling upward to the Gas Pumps. Instead, it will allow the gas to pass through freely. Connect the Water Pipe to the Electrolyzer, and it will start producing oxygen and hydrogen from the water. The gasses will rise through the tiles to the upper floor. 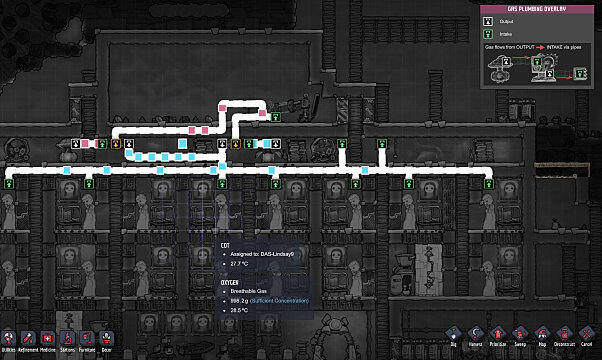 Since hydrogen is not breathable, you need Gas Pumps on the top floor to consume it and send it into the Hydrogen Generator through Gas Pipes. In this way, you will burn the excess hydrogen, making the air in the base breathable. 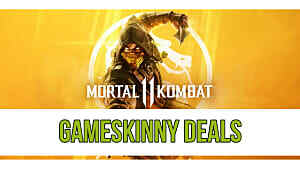 You'll also be able to turn it into an energy source. If there is a source of contaminated air in your colony, be sure to install an Air Deodorizer. It only needs 100kg of Raw Metal, and it will be able to convert about half of all polluted air in the area into a clean, breathable gas. 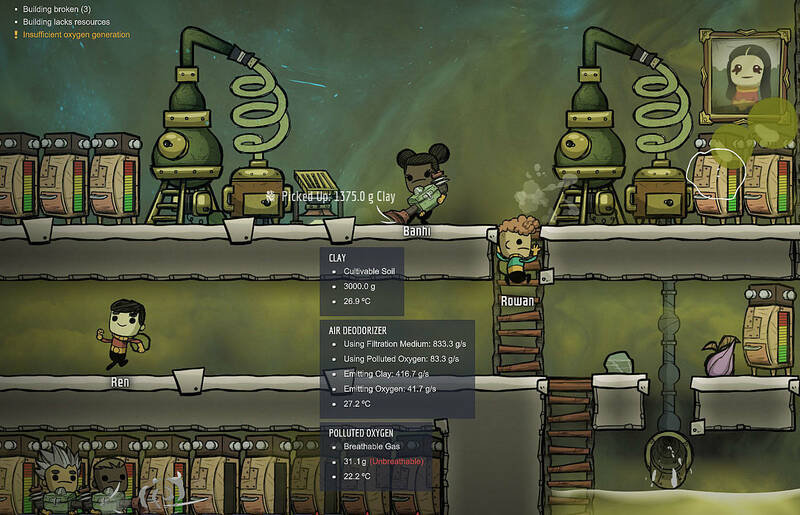 Usually, polluted air is lighter than the clean air that moves it up, so keep the Air Deodorizer somewhere on the top floors of your base. Also, in order for the Air Deodorizer to work as intended, it needs a filtration medium, such as simple sand, which you should have in abundance. With the help of these simple tools, your colony will have enough clean air for breathing. 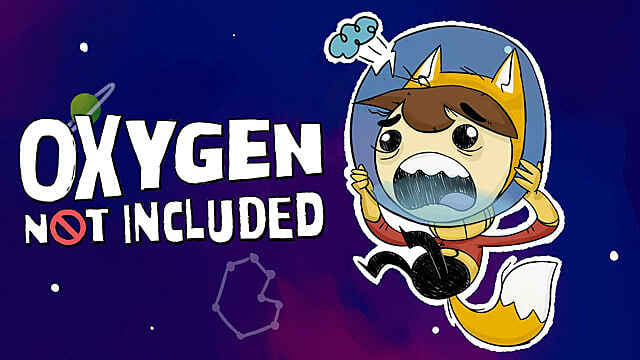 And make sure to check all of our other Oxygen Not Included guides.